その昔、新湊から見える海は「奈呉の浦」と呼ばれていました。漁師さんをはじめ海に関係する生業を持つ人々がたくさん住んでいたこの地には、今でも「奈呉」という地名が多く残っています。だから作っちゃいました！Nago Tシャツ！！（略してナゴT） ナゴT第一弾は、大伴家持とあの革命家を融合させたYakamochi? Tシャツです。 約1300年前、越中国司として赴任した大伴家持も、この海をたくさんの越中万葉に残しています。家持がこの地にもたらした文学的な財産は計り知れません。歴史的に見ればそれはまさに革命！家持の詠んだ歌の光景を求めて、松尾芭蕉や多くの文人たちが訪れているのです。 鮮やかな色で注目を浴びるもよし、渋めの色でこっそり主張するもよし。 ちょっと強くなれる気がするTシャツです。 --- 【サイズ】 ◎サイズS（女性Mサイズ） 身丈61cm／身幅43cm／肩幅38cm／袖丈16cm ◎サイズL（男女共用） 身丈71cm／身幅53cm／肩幅46cm／袖丈21cm ◎サイズXL（男女共用） 身丈74cm／身幅56cm／肩幅49cm／袖丈22cm 【素材】 綿100%　（杢グレーのみ：綿80%・ポリエステル20%) 【カラー】 サイズS（女性Mサイズ）とサイズL（男女共用）は、 カラーバリエーションが豊富です。 ※1枚1枚手で刷っていますので、家持の衣のカスレや文字の配置が異なります。 この世に2つと同じものはありません。 ********** Nago T-shirt [Yakamochi?] revolutionary type ※Tax included ※Postage excluded (More details can be found here.) ※Postage free for orders over 10,000 yen. A long time ago, the sea that can be seen from Shinminato is called “Nagonoura.” Since many people around this area have made a living by fishery related businesses, “Nago” is still used as the name of the town in quite a few places. So, we cannot help making Nago T-shirts (called NagoT)!! The first one is “Yakamochi? 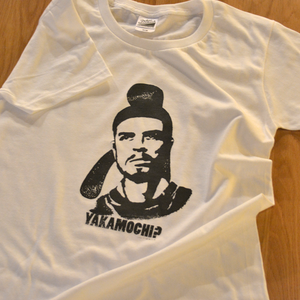 T-shirt” which is a fusion of Otomo no Yakamochi and the famous revolutionist. Abour 1,300 years ago, Otomo no Yakamochi who was a Governor of Ecchu Province left a lot of poets reading about the sea. It cannot be overestimated how much credit he has brought to this area. Historically, it was like a renovation! A lot of literary figures has visited this place to see the great scenery that Yakamochi had left in his poets. It all depends on your preference, drawing people’s attention in a vivid color or silently looks chic in a sober color. You will feel more confident in yourself when you put on this T-shirt. --- 【Sizes】 ◎Small (Medium for Ladies) サイズS（女性Mサイズ） Height 61cm / Width 43cm / Shoulder length 38cm / Length of a sleeve 16cm ◎Large (Unisex) サイズL（男女共用） Height 71cm / Width 53cm / Shoulder length 46cm / Length of a sleeve 21cm ◎Extra Large (Unisex) サイズXL（男女共用） Height 74cm / Width 56cm / Shoulder length 49cm / Length of a sleeve 22cm 【Materials】 100% Cotton (Heather gray only : 80% Cotton and 20 % Polyester) 【Color】 A variety of colors are available for size Small (Medium for Ladies) and Large (Unisex) . ※Please note that these T-shirts are handmade and each shirt has a slight difference in printing. Your shirt will be the only one in the world.